(Reuters) - Rory McIlroy celebrated St Patrick's Day in style by becoming the first player from Northern Ireland to win the Players Championship, emerging as the last man standing to beat Jim Furyk by one stroke in Ponte Vedra, Florida on Sunday. On a day when 15 players at one stage were within two shots of the lead, McIlroy eventually emerged from the pack, overcoming an early double-bogey by displaying enough maturity to hang tough before moving in for the proverbial kill. 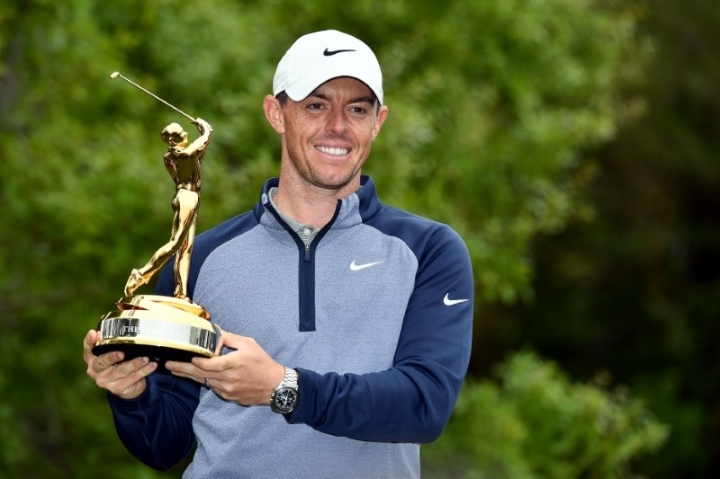 McIlroy carded two-under-par 70 at the famous TPC Sawgrass course in Ponte Vedra Beach to win a championship that was first held in 1974, when it was won by Jack Nicklaus. McIlroy finished at 16-under 272 to edge American Furyk, who with a gimme birdie at the final hole threatened to become the event's oldest winner at the age of 48. "Sawgrass and I didn't have the greatest relationship starting off," McIlroy told reporters, referring to missed cuts in his first three appearances from 2009-11. "It's a massive win on a course (where) I've had mixed results. I had to show a lot of character out there. Any time I looked at the leaderboard I was pleasantly surprised I hadn't fallen two or three shots behind. "That gave me a little bit of encouragement to keep going and play a great back nine. I am just thankful that it was my turn this week." With Furyk already in the clubhouse, the 29-year-old McIlroy knew what he had to do as he played the final three holes. After a birdie at the par-four 15th, he used his power to reach the par-five 16th in two shots and a two-putt birdie gave him the lead. Furyk shot 67 to finish alone on 15-under. "There's a little disappointment, thinking maybe I played well enough to win," said the American. "Rory obviously felt differently." It was Furyk's 31st runner-up finish on the PGA Tour, the same number as Tiger Woods who has also won 80 times compared to his compatriot's 17. Englishman Eddie Pepperell (66) and Venezuelan Jhonattan Vegas (66) finished two strokes behind McIlroy in a tie for third. Pepperrell and Vegas sank monster birdies at the par-three 17th, Pepperell sinking a rollercoaster 50-footer before Vegas one-upped him with a 70-footer. Overnight leader Jon Rahm floundered, the Spaniard making three bogeys in the first four holes and compounding his misery by dunking his tee shot into the water at the par-three 17th. He shot 76 and finished equal 12th on 11-under. He will head to the Masters next month brimming with confidence, needing a victory at Augusta National to complete the grand slam of all four modern majors. "I'm just really proud of myself the way I played the last few holes," he said. "(I was thinking) why not me? This is my tournament and I've got to finish it off. "To step up and make those three good swings, it's very satisfying knowing that it's in there when it needs to be."